For POS applications across a wide range of verticals, mobile computing is fast supplanting other methods of enhancing customer interactions. The point-of-sale and point-of-service options provided by a rugged tablet PC can streamline processes in almost any customer-facing industry, increasing productivity and efficiency while eliminating lags in service. Rugged tablets are durable enough to stand up in almost any working environment, and can be utilized to simplify operations across the board, with a vast toolbox of solutions for familiar issues and the flexibility to adapt to different environments. Whether the setting is a restaurant, a casino, or a hotel the tablet bears up under constant, rigorous use, and in the retail sector there is no device that compares for convenience and customer satisfaction. Employees can use the tablets’ built-in RFID readers and barcode scanners to quickly bring up product information on screen and check available inventory. Tracking tells the employee exactly where the item is for easy, fast retrieval. Encrypted MSR and EMV smart card readers for payment allows the checkout process to begin immediately, eliminating long lines at the register. Out of stock items can be verified in stock elsewhere, purchased, and delivery arranged on the spot. Rugged tablets can be used at the front desk for sign in, on carts for room service, and at checkout to settle the bill. Internally, linen inventories can be checked, rooms slated for cleaning marked off and notes kept for special instructions by room number. The durability of the tablet can stand up to drops or other shocks, and long battery life means they last the whole shift. Wireless capability allows for mobility and communication with adjacent restaurants or casinos for a seamless process. Tablets used for at-table ordering speed up the process, immediately transferring orders to the kitchen, allowing more secure payment in front of guests and faster turnover. The check can be requested and handled at the customer’s convenience, and completed transactions can notify management that a table is opening up for faster clearing and reseating. The tablet is spill proof and durable, even for family style dining. Compared to consumer grade tablets, or PCs at fixed points requiring repeated visits to the specific location, rugged tablets bring flexibility and mobility to the world of retail and hospitality. As a POS solution, tablets are rapidly outstripping more traditional options, with benefits that are unmatched by other devices. When the ultimate goal is to get something from point A to point B in the quickest, most efficient, cost effective way possible, real time data can facilitate goods from one destination to another. Real-time, accurate data is vital to gaining efficiencies, increasing productivity and minimizing costs. Rugged tablets allow you to access, process, and transmit data from anywhere to anywhere, giving both in-the-field employees, location based retail personnel, and warehouse workers access to information at every point on the supply chain. Fast, efficient barcode and RFID readers that make tracking easy. Wireless integration that keeps all the important data right at your fingertips. Rugged builds that can survive handling around moving boxes, crates and packages. Transportation and logistics applications start at the pickup point, whether it is the manufacturer to warehouse run, the warehouse to retail leg of the journey, or the direct to customer trip. If cargo must undergo cross dock transport, keeping track of it is easy with information passing rapidly between tablets at different points of access. Yard logistics are simplified when loading, inventorying, and unloading, keeping the data trail intact. Finally, delivery can be verified and the ticket closed remotely, with all data sent immediately for confirmation online. Extra mobility is added to the rugged tablet with the option of ports that can support various hardware and applications, and mounts and cradles that allow tablets to be secured to walls, forklifts, or inside vehicles. The versatility allows each rugged tablet to be customized for a specific point of use in the logistics chain, and to be outfitted for crosspoint use and easy handoffs throughout the supply chain. From the manufacturing facility, to the warehouse, to the road, rugged tablets are flexible and durable enough to take whatever the changing environment throws at them. Drivers can stay in touch with dispatchers regarding delivery details or any issues that arise while they’re in the field. The bottom line? Increased productivity, less wasted time, and lower margins of error from the beginning of the supply chain to the end. Rugged tablets are ideal for use in warehouse environments for many reasons. The marriage of superior software and durable hardware make rugged tablets the take-anywhere, do-anything solution for workflows that require mobility and functionality. What Makes a Tablet Enterprise Friendly? The tablet can travel through the warehouse, creating a data trail that is recorded, stored, and transmitted as needed to other devices or stationary points. From the time an item arrives until the moment it leaves the warehouse, it can be tracked, identified, registered, inventoried, labeled, and deployed from the convenience of a tablet. Workers on the warehouse floor can scan codes, take instant images of damaged goods or items that require repackaging, verify physical locations, and share information. Upper levels of management can carry tablets on the fly, receiving and filtering the data they need to keep the warehouse running at optimal efficiency. Logistics can be seamlessly tied into the floor with incoming and outgoing shipments recorded at every step, and images taken of invoice numbers, details, security seals, and paperwork. Documentation data becomes much less error prone and is quickly retrieved when needed. Rugged tablets are the answer to multiple choke points in warehouse operations, and can be utilized at every level to increase efficiency and productivity. These long lasting, durable workhorses will prove their value as productivity increases and issues decrease. Rugged tablets are swiftly becoming the new hot point for automation, bringing new customization, efficiency, and speed to manufacturing workflows. Standardizing mobile computing technologies for any given workforce is a proven way to increase productivity, and mobile tablets bring the latest in technical excellence and physical durability to the manufacturing industry. With rugged tablets in play, different sections of a line operation can communicate in real time – not just as an alert system but as a fast, effective solution finding factor that controls downtime lost to blips in the process and enhances recovery when there is a situation that slows down the line. As a lightweight, durable alternative to traditional computers and off-the-shelf tablets, rugged tablets are made for on-the-floor use, and can streamline almost any workflow. Mobile computing devices like rugged tablets arm your workforce with effective, easy to use tools that give them real time information. This leads to faster, smarter manufacturing processes, less downtime, higher worker productivity, and less errors on the floor. Worker time is more efficiently designated, leading to a faster, cleaner operation. Warehouse layouts and logistics can also be controlled and adapted to the new, improved way of management, creating a workflow that is devoid of wasted time and effort. Since the ultimate goal of any manufacturing company is produce and distribute goods as swiftly, accurately and safely as possible, the rugged tablet provides the perfect complement to training and planning. By putting a reliable, durable, and high tech device at the service of the workforce as individuals, you can bring them together in real time as a whole, cohesive team. The durable design and portability of a rugged tablet are ideal tools for reaching manufacturing goals. Manufacturing is a demanding environment, and the success of any manufacturer is dependent on the efficiency of a multifaceted workforce. A company that outfits and trains each worker in the use of the latest technology available sees an amazing ROI in the form of an operation that suddenly is performing at an optimal level. The construction industry, despite hundreds of years of advances in technology, remains one of the most dangerous in the world. The multiple risks on the job site include countless moments during each act of labor that can put a worker at risk. Most of the mitigating measures in place are physical – better gear, better machinery, better protective clothing and boots, gloves, and goggles. However, technology is finally coming up with more ways to help than the purely physical and rugged tablets can now go a long way towards making a construction site safer for workers in the industry. How do Rugged Tablets Differ from Consumer Tablets? A rugged tablet might seem essentially the same as the other tablet computers that are on the consumer market. However, a closer look reveals there is more here than just a more rugged case – the entire tablet is designed to endure harsh environments. Rugged tablet design has been enhanced in order to keep devices functioning properly in rough conditions such as those present on a construction job site. A rugged tablet simply doesn’t have the same risk of leaving workers in a lurch. How can Rugged Tablets Help on Construction Sites? In addition, rugged tablets can contribute to a safer environment for everyone on the site; for example, if one worker is absent, another with the correct skill sets and qualifications can be found and moved into position. There’s no worrying about whether or not the individual is qualified based on word of mouth. Having the right person who is least likely to cause an accident or incur an injury can be priceless when there are deadlines to meet. This means no weak links on an existing job site. Rugged tablets also allow for men to give safety updates before before beginning work with a new crew. Projects updates can be quickly sent out, and last minutes drawing changes can be quickly distributed to all team leaders. Instructions for emergency first aid and evacuation procedures can also be stored for reference in time of need, and each worker’s pertinent medical details can be stored for fast access by medical personnel and a more effective response to workplace injuries. 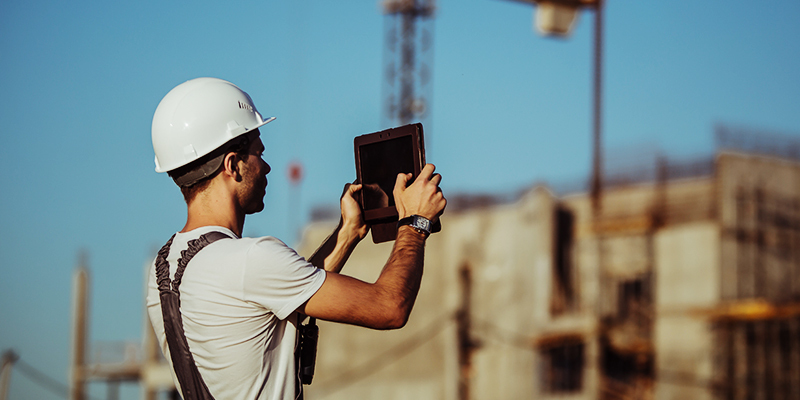 Rugged tablets are a benefit to many verticals, and the construction industry is only now beginning to tap the amazing range of features available.